When scheduling a backup task in Windows, you must specify a valid user id on the operating system. The following steps demonstrate how to run a backup task using the built-in SYSTEM account on Windows. 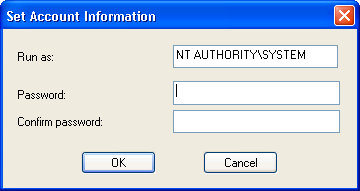 Leave the password field blank when using the SYSTEM account. That should be it. Now even if Syncrify Client is run under the "SYSTEM" account, it will know the path where profile information is stored.